Plenty to think about.Thanks again for the help. Dang, somebody knows my stuff as well as I do. Pretty much what he said. If you can't switch the motor windings over into a lower voltage configuration you will need to use a step up transformer to boost your local voltage up to where you need it. From there you can build the converter circuit to work at that voltage level instead. If you need a cheap step up transformer look for a HID (mercury vapor, metal halide or high pressure sodium) ballast for a larger lighting system. Most of the higher wattage (1000+ watt bulbs) systems use multi tapped ballast transformers, which in your area will likely mean having both the residential 220 - 240 VAC and the higher 400+ VAC commercial input taps, which when used just for voltage buck boost work they are a very cheap and effective alternative to a higher cost normal power transformer. Unlike microwave oven transformers which are designed cheaply and run at their near limits in normal short duty cycle open air cooled use, HID ballasts transformers are extremely robustly built and handle severe abuse given their possible working environments can be incredibly hot and may require them to operate continuously for years that way. Their iron cores are over sized for the wattages they are rated for and their windings are typical insulated with class H or H+ enamel which can easily handle 180C (350+F) working temps all day long. Thanks for that tip tcmtech I will look out for those ballast. Well I've got my installation working. The control box isn't attached to the wall yet, but apart from that, it's finished. 1. 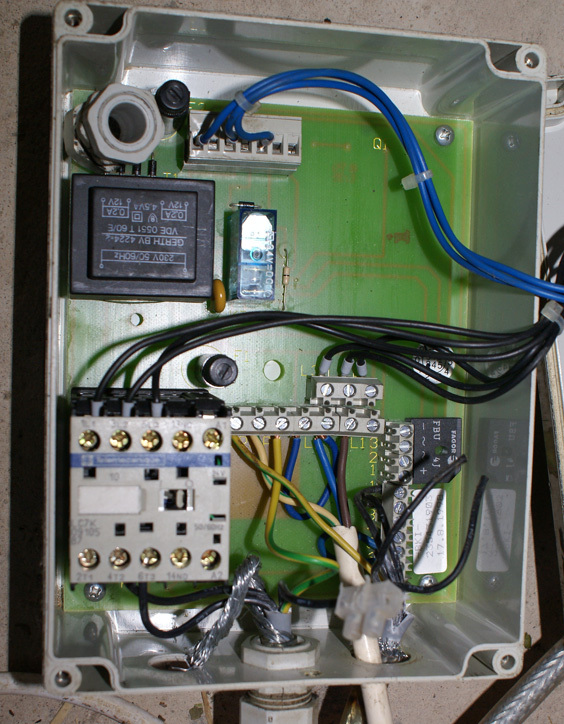 Wire the motor controller so that it feeds 230 V and neutral instead of 3 phases, while leaving the control circuit running. 2. Reconnect the motor for 230 V.
3. Fit the capacitors and relay, which the largest part of the work. 1. Wiring the motor controller. All I had to do here was wire the neutral supply into one of the input phases, making sure that the live connection is still connected to the control circuit. For this controller, the central connection runs the control circuit. The three line inputs are L1, L2 and L3. L1 is now unused, L2 is live and L3 is neutral. Live and neutral come out on terminals 4 and 6 of the contactor. The neutral input is also linked to the original neutral to run the control circuit. 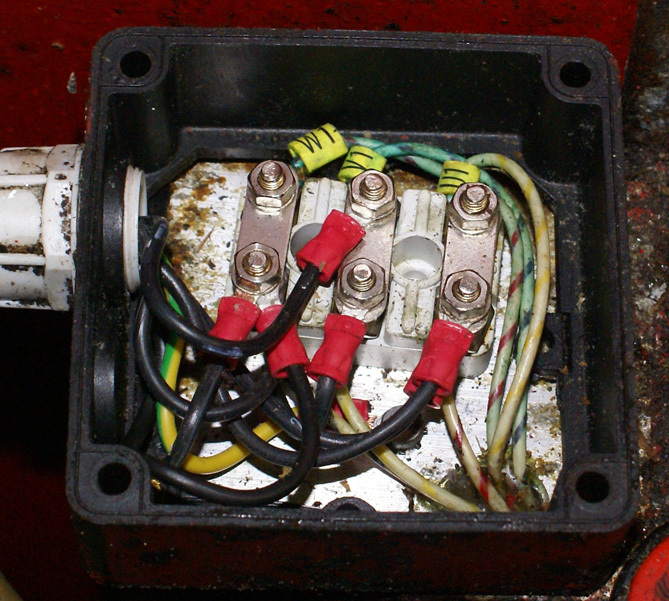 The three line inputs were the three terminals at the bottom of the photo, and when it was connected for 380 V, the top three terminals were joined together in star configuration. When it is wired as shown, in delta configuration, it is connected for 240 V. The motor windings are arranged like that, and all three links are provided when only two were needed for 380 V, because the motor was arranged for easy conversion between the voltages. 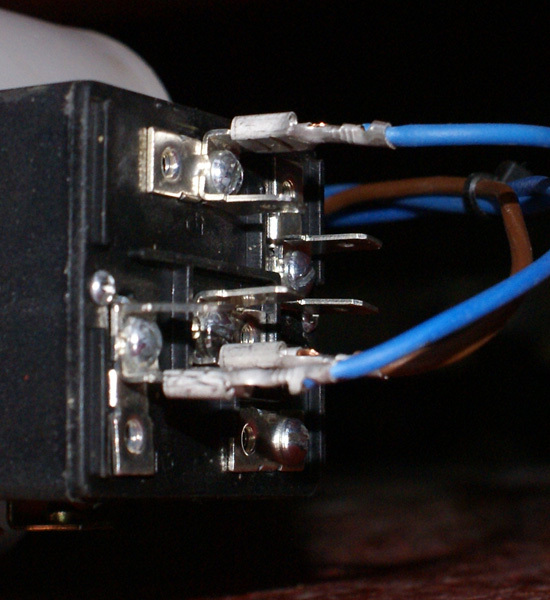 Each motor terminal has two wires, one from the control box and one to the capacitors and relay. There is a spare wire from the control box to the motor, because I continued to use the wiring that had been used on 3-phase when the lift was new. http://uk.farnell.com/kemet/c274ac35300aa0j/cap-film-pp-30uf-470v-snap-in/dp/1789706 and I used 20 of them. The relay was this one:- https://www.ebay.com/itm/171115022408, which is an Supco APR5 Universal Adjustable Potential Relay, if anyone is looking afer eBay remove that item. I couldn't find one in the UK. On these lifts, it they run in the wrong direction they just make a squeaking sound and do nothing, so there is no harm in running them to find the right direction. 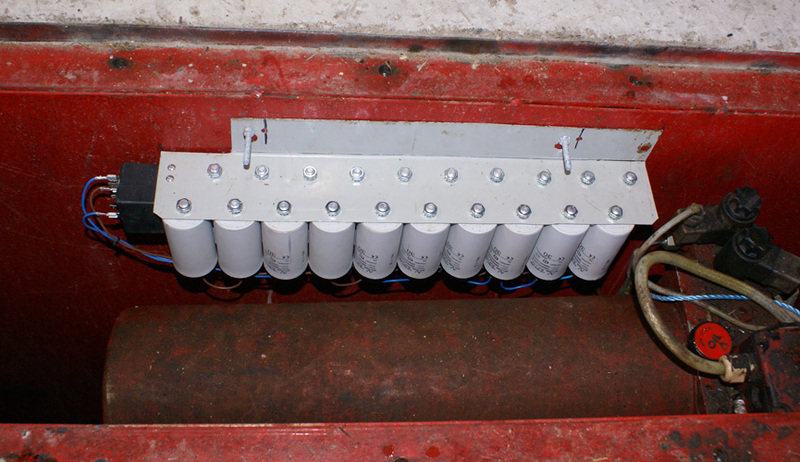 The big dirty red cylinder in front of the capacitors is the hydraulic pack and the motor terminal box is on the right of the photo. The motor is inside the hydraulic pack somewhere, but I've not seen inside it. I'm happy to answer any questions about it. As an aside, I tested it with just 6 capacitors controlled by the relay, so a total of 10 not 20. The lift worked, but it would not restart with a car on it, so I had to raise it in one go to the height that I wanted. Lowering is with the solenoid valve, so that doesn't need capacitors. With all 16, it will restart with a car on it. Many thanks to tcmtech for his circuit and suggestions. Hi got my rotary converter up and running it is 3 hp for lathe and mill.I ended up getting a transformer 230v in and 395v out.Haven't used it under load yet but when running the the voltage at the three legs of the idler motor are 455,438 and 395.The amp reading with a clamp on amp meter is 5.7,5.3 and 1.4.Any thoughts on these readings do you think I need to modify? Try switching the three leads around and see if the numbers follow the new configuration. If so either the one of the phase balancing capacitor sets is not working or needs adjusting a bit or the start capacitor set is not disconnecting. If the relative phase to phase voltages don't follow the same pattern with changing which phase leads are the primary feed and which is the third leg you may have a partial short in one phase winding. Tcmtech thanks for taking the time to reply.Changed the leads around from the motor got the same original readings so this should rule out short?Start capacitor is on a relay which disconnects when motor starts but I disconnected a lead form it as well and got same readings.How close should the voltage readings be what is an acceptable balance and what will happen if I can't get them to this? Does switching your two phase balancing capacitors sets around move the voltage and current values with them? If it does one capacitor is not the right value or is not working right. No.I ran the lathe for a short today with the rotary voltage was 419,396 and 389. I'm assuming you're using a ~400 volt input which if so you're well within +- 10% of that so I wouldn't worry about it too much. More than likely the two phantom phases that are being generated are not exactly 120 degrees (more like ~110 and ~130 degrees) out of phase with the primary input phase which is why you're seeing the odd voltages. How they read at maximum load is more of the concern than it is at light loads. The discussion on 3 phase to run on singel phase using capacitors is very informative as I am in the process of doing this . I hav had the motor running but am not happy with the voltage on one of the phase. I will have to adjust the capacitance of the winding in question. I will post a vido when finished and will ask questions if I have problems. Keep up the good work as I am very interested in things that are different and reading about any thing. Should the run current be the same across the 3 phases. No it wont be exactly the same all the time. +- 10% or less of each other as the loads vary is normal and a good range to shoot for when adjusting the balancing capacitor values. Same with voltage variations between the phases. Typically what you are aiming for is to get the lowest input current on the supply lines for whatever maximum load the motor is driving without having any single motor phase line exceeding the motors maximum current rating. In most cases just going by the approximate nearest convenient capacitor values the calculations I gave give you gets things more than close enough to work properly. I am using this top design as my converter. Still having trouble selecting the right potential relay. When the motor is running the generated voltage I am getting from PH 2 is 159 V. Should that be what I am looking for in dropout voltage. I am running a 2 HP motor on 230 V. I tried the Supco brand adjustable relay but could not make it work as it would never stop chattering. Can you recommend a retailer for choosing a relay. Why is your 6x550 potential relay connected to the ground and not L2? It has a ~ 160 - 180 volt pick up and 330 volt coil holding voltage rating so if you are at 159 volts you are way under its working voltage. Also do you have the two 20 uf phase balancing capacitors in the circuit some place? So you're not using my design yet figure I can help you troubleshoot something that doesn't work nearly as well? Before I ask many questions. What is worse using an unbalanced third leg or using just two legs. Chose to use other design to keep thing as simple as possible. But ran into problems with the potential relay. Thank you for your response thus far. Depends on the application but neither work very well being you're trying to force a three phase motor to run in a condition it was never designed to work for. That was the whole point of my work to overcome those problems which lead to the design I have here. If you want something that obviously doesn't work very well because you feel that simple cheap and unreliable is best then I can't do anything for you. So with a 3 kW motor, on a lift rated at 3 tonnes, I would have thought that lifting a 1.5 tonne car wouldn't be too much for a 230 V, 13 A circuit, but the lift has blown a few 13 A fuses. Today I measured the current while the car was being lifted, and it was running around 30 A, which explains why the 13 A fuses aren't lasting very long. Anyone got any ideas why it's taking so much current? Would the power factor be terrible? Should I be adding another load of capacitors for power factor correction, or should I used the existing ones once the the starting is over, which is only about 1/4 seconds? I am in the U.S. I am trying to help a friend with a small wood stake mfg. mill. He has a 50 HP commercially built rotary phase converter; 230V single phase in, 230V three phase out, it starts by itself when he turns on the supply breaker for it. It has a self start circuit/caps but obviously no balancing caps. It runs various 3 phase motors in his mill very nicely. I am attempting to use TCM TECH's schematics and info to try to balance the 3 phases out. He recently purchased a small planer machine that has a VFD on the infeed rolls motor, it has a very hard time utilizing the 3 phase because of severe voltage and current imbalance. In other words it faults quite often. 2) If I use enough caps for 50 HP what happens to the balance when some of the motors are off, and the total HP using the system is much less ?